There’s a mount specific to whatever you’re looking to do with your GoPro, from surfing, skateboarding, playing music, or wearing it like a fashion accessory. You can use this mount, shown here, in three ways: as an extension arm, camera grip (when detached from the arm), and tripod. This cool mount expands to 20 inches and collapses to 7.5 inches, and it’s waterproof. No, it’s not for capturing a movie at your favorite watering hole, though it’s entirely possible to put one of these mounts around a beer tap or stool leg. This mount allows you to attach your GoPro to just about any kind of bar with a diameter of 0.75 to 1.4 inch. The included adapter lets you attach the camera to even narrower bars. Put the camera on the handlebars on your bike or motorcycle, or a windsurfer or ski pole. The included pivot arm lets you adjust the camera to the perfect angle. The roll-bar mount is for much thicker bars, from 1.4 to 2.5 inches in diameter. That covers mountain-bike frames, go-karts, and even cars with roll bars. The Sportsman easily attaches the GoPro to sporting equipment such as a fishing rod, hunting rifle, or bow so you can capture all sorts of outdoor adventures. The mount fits around anything with a diameter of 0.4 to 0.9 inch. The mounting point is on the back of the camera, not on the bottom. 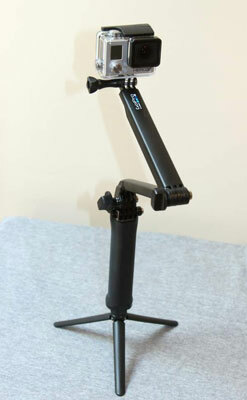 Microphone-stand mount: This dandy little device transforms a microphone stand into a tripod of sorts. It’s compatible with standard microphone stands when you use the included adapter. It comes with a quick-release base that allows you to move the camera between mounts and locations. 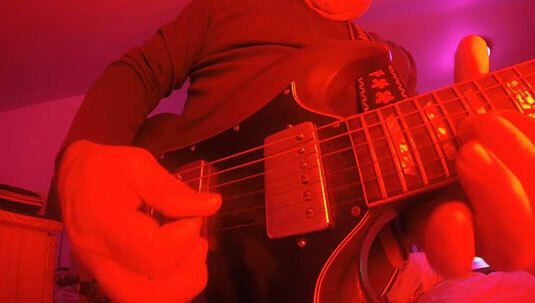 Instrument mount: If you’re looking to get a little closer to the action, opt for a removable instrument mount, which allows you to attach your GoPro to a guitar (see the figure), bass, drums, or keyboard. You can even mount it on a turntable, if spinning vinyl is your jam. These temporary mounts have nondamaging adhesive that’s safe for most instrument surfaces. The kit includes three mounts (reusable) and two single-use adhesive strips.